I'm trying to send a mail merge from multiple people. I was wondering if there was a way to choose the sender address based on the recipient email address? I'm using an Excel file as the source of the merge and the sender names associated with the recipients in the excel file so I can add a field after the closing line in the document to have the senders name appear. No, Outlook can’t do this, at least not as a native feature within the mail merge. Mail merges will always be sent from the default email account. However, it is possible if you use a macro to handle the merge, not the mail merge wizard. 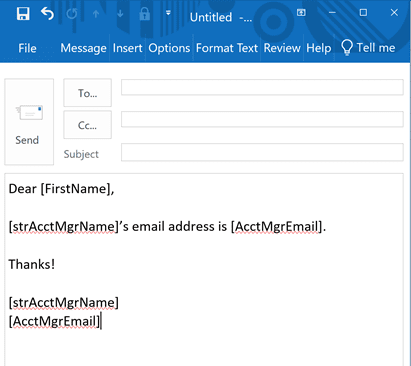 This macro reads values from an Excel worksheet and sends a mail merge, replacing unique values in the Outlook template with values in the worksheet. It also sends the message From an address in the worksheet. Create an Outlook template, entering unique values where the merge fields would be entered. While you could use standard merge fields or bookmarks, you would need to use the Word Object Library to update the fields. Using unique values allows us to use VBA's Replace function. 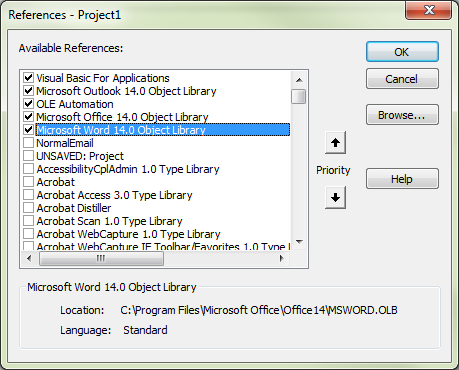 strAttachPath = enviro & "\Documents\Send\"
Do Until Trim(xlSheet.Range("A" & rCount)) = ""
To check your macro security in any Office 2010 application and newer, go to File, Options, Trust Center and open Trust Center Settings, and change the Macro Settings. In older versions look at Tools, Macro Security. If you receive a "User-defined type not defined" error, you need to set a reference to another object library. I'm not sure exactly what you want to do or what fields you want to update, but the processs is similar - set a reference to the other object model and properly reference it. In most cases, you can use a macro from the other program with just a few tweaks. Thank you very much for the above and it is working like a charm for me! I'm trying to change this code so that I can fill up some values in a table (That I created in the email template). When I run the Macro the email loses all the formatting including the table rows and columns and just fills the data one after the other. Is there a way to fix it? Thank you! Thank you Diane! It did work but there were a couple of things that I had to figure out. I had to spell check the email template and ignore all errors and save it before running the Macro! Apart from that need to make sure the template is saved in HTML format. That's it! Thank you again for your help! Hi,I have created a button in excel which on clicking send an email .But i want to make it much more convenient .Rather than opening Excel file every time and clicking the button,I want to create a macro in outlook mail which on clicking generate this email .Could it be done? Sorry l missed this earlier - yes you can create it from Outlook. Hi, When I use the VBA code, it doesn't use my template. Instead this displays an unrelated draft from my email account with the email addresses from the spreadsheet. Even after I deleted the draft, the macro still creates emails from that old draft. Did you change the code to use a different template ? 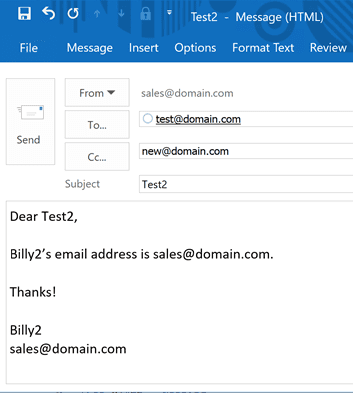 Hi, am getting error as "user defined type not defined" - Compiler error at "Dim olItem As Outlook.MailItem". thank you this is helpful. what do I put in the "enviro = CStr(Environ("USERPROFILE"))" is this the path on my C drive of my user profile?